As the name would suggest, Gemini (which means “twins” in Latin) is the name given to two astronomical observatories. The first, Gemini North, sits in the northern hemisphere atop Mauna Kea in Hawaii. 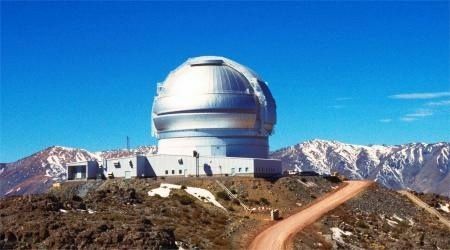 The second, Gemini South, sits in the southern hemisphere at Cerro Pachón in Chile. The locations of these two observatories provide complete access to the sky from both hemispheres. The idea to construct the two observatories arose in the mid-1980’s. The venture really got going in 1990 when an agreement was signed between the United States, the United Kingdom and Canada. Other countries joined the group and the final financing for the observatories was made possible by the United States (48%), the United Kingdom (24%), Canada (14%), Chile (5%), Australia (5%), Argentina (2%) and Brazil (2%). Observation time is distributed in these same proportions. 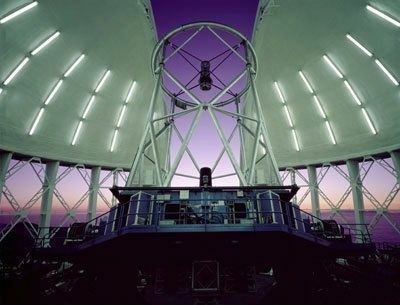 Gemini North saw first light in 1999, whereas Gemini South opened a year later in 2000. The telescopes of both observatories are identical: each mirror is 8.1 metres across, 20 centimetres thick and weighs 22 tonnes, and each mobile structure weighs 342 tonnes. The instruments on each telescope, however, are not necessarily the same (cameras, spectrometers, etc.). 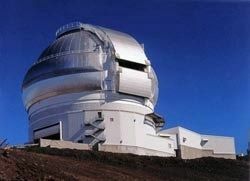 One of the main contributions made by Canada was to provide an adaptive optics system: a system that corrects image distortion due to turbulence in Earth’s atmosphere. A well-known effect of such turbulence is the twinkling of stars. The construction of the dome, the support, the subterranean facilities and the system that controls the rotating part of each telescope was also Canada’s responsibility. A distinctive feature of the Gemini telescopes is their active optics system, which compensates for the effects of deformation in the main mirror (the mirror has the tendency to sag under its own weight when the telescope is pointed toward the sky). The system consists of 120 hydraulic jacks under the mirror that provide constant adjustments to restore it to a perfect shape. The adjustments are typically on the order of one thousandth the width of a human hair. The observatories were specifically designed to observe visible light, but also infrared light. Clouds of gas and dust hide large sectors of space, like the regions where stars and planets are forming, or the cores of galaxies that contain quasars and black holes. Infrared light is of great interest to astronomers because it is able to penetrate these clouds and reveal details that would otherwise be invisible. The reflecting surface of the Gemini mirrors is made of a thin film of silver that reflects infrared rays better than aluminum, and the domes of the observatories are a metallic grey colour instead of the traditional white to keep the temperature of the telescopes constant. Moving hatches allow the observing slits to open across the entire dome. All these finishing touches make the Gemini telescopes expensive instruments to operate. 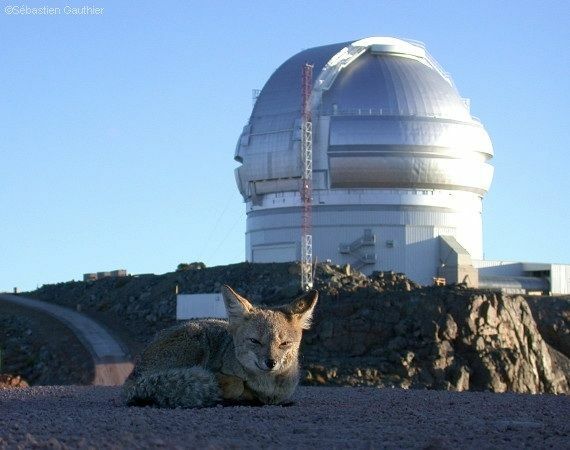 It currently costs about $50,000 for a single night of observation at one of the telescopes. 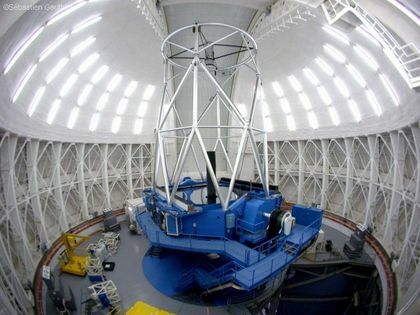 Astronomers, however, do not have to spend this amount themselves: user fees for a Gemini telescope are paid by the national agencies that finance the observatory. Canadian participation in the Gemini telescopes is currently the responsibility of the National Research Council of Canada’s Herzberg Institute of Astrophysics. Jean-René Roy talks about the Gemini telescopes. The two telescopes were built to take advantage of certain qualities of the instrumentation at the observatories; in particular, the goal is to produce the best images possible through our atmosphere despite turbulence and despite problems of variable transparency. The telescopes were also built to perform well in a region of the spectrum that has wavelengths longer than what our eyes can perceive, and which we call the infrared; specifically, the near-infrared and the mid-infrared. In the mid-infrared range, where the wavelengths are about 10 to 20 times longer than what our eyes can see, the waves kind of represent the heat that we feel coming from a hot source in our home. The optimization of these telescopes for the infrared was spurred on by the scientific desire to explore targets that are hidden by dust, which will help us better understand the formation of stars and planets, and to explore the farthest reaches of the Universe.